Once upon a Monday, there was a chocolate chip cookie (if you must know, it was a Chips Ahoy!) that was dropped on the bumper of a Jeep. Now, this cookie wasn't thrown down in disgust. Princess Julia would never let a cookie go to waste - she's also a part time cookie monster, but don't tell anyone I told you that. This cookie, not wanting to spend an eternity in a landfill, decided to go on an adventure. For a week, it adventured on the bumper of the Jeep, through rain and shine. It explored many places on Long Island, including the Smith Haven Mall. The cookie hung out with three magical children, and was accidentally stepped on at some point. 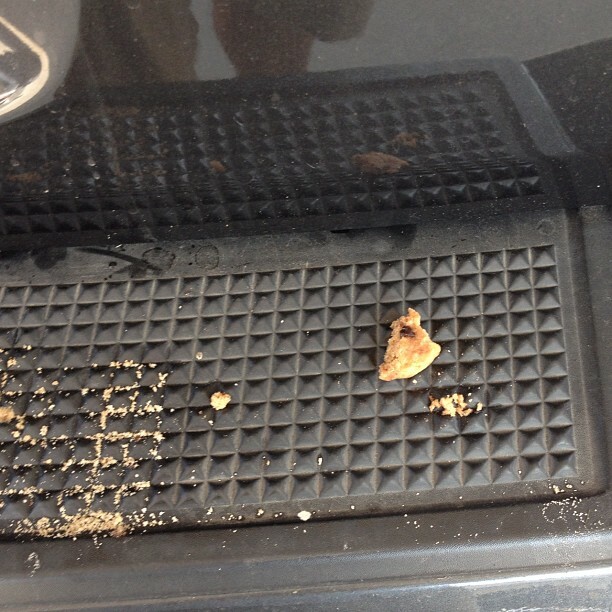 This unintentional crushing from the mighty Matthew did not kick the cookie off the bumper, though. This is one tough cookie who really seems to be enjoying the sights and sounds on the island! The moral of the story? No matter how much you get rained on, stepped on, or are left hanging, it doesn't matter in the end. You're a tough cookie - hold on tight and try to enjoy the ride. *No cookies were harmed in this adventure. This cookie is a trained professional. Please do not attempt this on your own, for it will most likely result in a waste of a delicious cookie and cookie monsters across the Earth will cry out in anguish. Photo courtesy of my cousin, Joe. Thanks! We were joking around on Facebook about documenting the travels of the cookie, so this was the next best thing. Just read this to Matthew.. he said "that was hysterical!" Sadly, after 500 plus miles, the cookie's journey has ended. Two torrential downpours in one week proved too much for the cookie to handle. I wish him well on the next phase of his journey. Perhaps he will return as a very determined Grilled Cheese Sandwich. Be well, dear cookie. Be well.